Expandable from 1-6 colors & 1-6 stations. The HIX NP Premier Printer is the fastest manual screen printer in the world, the result of 45 years of engineering excellence. Expandable from 1 to 6 colors and 1 to 6 stations. Screens are leveled and ready to print in a matter of seconds. Micro-Registration Standard. Totally tool-less, on/off contact and inclination adjustments. The true "all-heads-down" feature allows printing at the speed of loading/unloading. Optional side clamps for improved grip & optional "Bigfoot" side clamps for extra large frames. Faster and easier cleanup with aluminum castings, anodized and epoxy coated finishes. Full range of optional interchangeable platens: from jacket hold-downs to sleeve boards as well as custom aluminum boards. Gas lifts NO SPRINGS! That means you'll never have to see your squeeges fly through the workshop. No need to hold the screen untill fully lifted. No jerky momvements which could take the press out of registration. 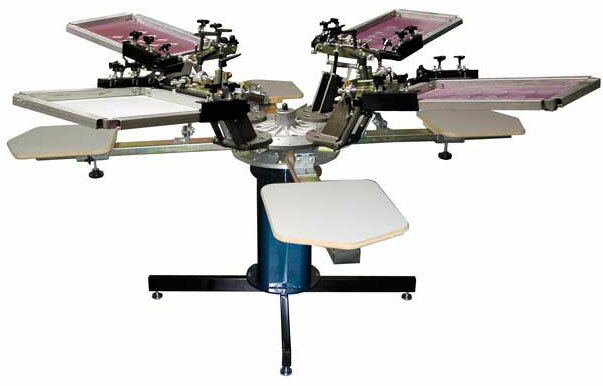 Custom large format and 8 color presses available. Standard with 15" x 15" wood boards and back screen clamp. King PIN Pin Registration compatible. Full one-year warranty.